Sergey received his Specialist’s degree in Mathematics and System Programming from Lomonosov Moscow State University. As a research student he worked in Marchuk Institute of Numerical Mathematics RAS on elaboration and analysis of new fast numerical methods solving multidimensional Smoluchowski coagulation equation under guidance of prof. Eugene Tyrtyshnikov. In addition, he participated in elaboration of novel semiclassical Monte-Carlo methods modelling the non-adiabatic molecular dynamics at Los Alamos National Laboratory under guidance of Dmitry Mozyrsky in 2014, 2015 and 2016. 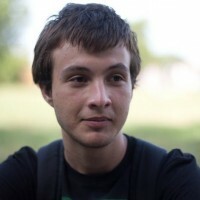 In 2015-2016 Sergey was a junior research scientist at CEE CREI working on elaboration of efficient computational tools for the molecular modelling. In addition to research and programming duties Sergey has also helped to establish new computing cluster for CEE and optimize use of the existing computing facilities. Since 2017 Sergey works as a member of group of Prof. Ivan Oseledets on research project devoted to monitoring of soil fertility factors and the analysis of the transformation of soil organic matter. During vacation time from Skoltech Sergey was 6-week visitor of CEES (Univ. of Oslo) and participated in joint Russian-Norway project devoted to mathematical modelling of Atlantic cod population dynamics. In 2018 he defended Candidate of Science thesis (PhD equivalent) in Marchuck Institute of Numerical Mathematics devoted to elaboration and justification of the fast numerical methods for Smoluchowski-typed equations. R. R. Zagidullin, A. P. Smirnov, S. A. Matveev, E. E. Tyrtyshnikov, An efficient numerical method for a mathematical model of a transport of coagulating particles, Moscow Univ. Comput. Math. Cybern. (2017) 41: 179. Matveev S. A., A Parallel Implementation of a Fast Method for Solving the Smoluchowski-Type Kinetic Equations of Aggregation and Fragmentation processes, Numerical methods and programming, Vol. 15, p. 360 – 368, 2015 (in Russian). Matveev S. A., Smirnov A. P., Tyrtyshnikov E. E. “A fast numerical method for the Cauchy problem for the Smoluchowski equation.” Journal of Computational Physics 282 (2015): 23-32. Matveev S.A., Tyrtyshnikov E.E., Smirnov A.P., Brilliantov N.V., A fast numerical method for solving the Smoluchowski-type kinetic equations of aggregation and fragmentation processes, Numerical methods and programming, Vol. 15, p 1-8, 2014 (in Russian).